270 years! That’s how long this fabric has been in use by coal miners throughout the world; and our mill has been in business weaving it, since 1777. The coal miners's gospel says, “Put a cotton moleskin shirt on in the morn, head for a grueling day below the earth’s surface and this cloth is the only protection between you and your skin.” Taking the shirt off as you walk through the kitchen door, holding the door open with one hand, while giving the shirt to your wife who has the waiting soap and hot water bath ready for both shirt and miner. 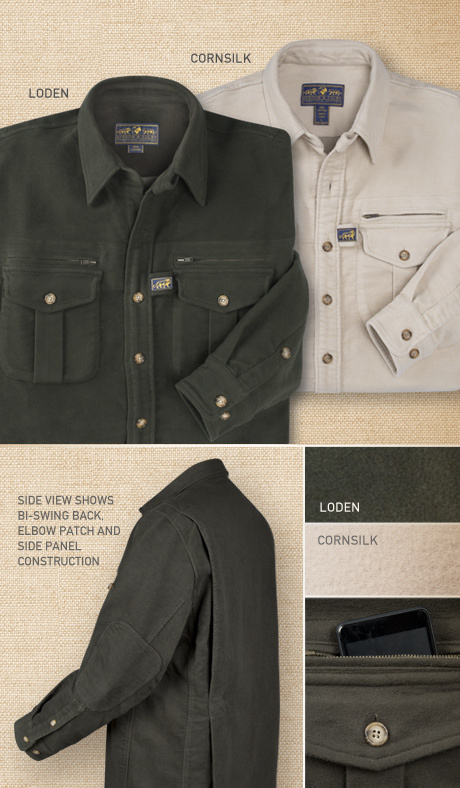 Fit Details: Many of the shirt's performance features, like side panels and bi-swing help to provide fit comfort – the size measurements in the chart below reflect standard industry sizing. We have built into our Signature shirts "body ease" - so if you find you are between two sizes in the standard chart below, we recommend dropping down in size, not up. There is little to no shrinkage due to garment wash of the fabric as part of the finishing.